The whole family can enjoy Tang Soo Do! The average ratio is ten students to one instructor. We have age and rank specific curriculum designed to help you and your child enjoy the learning process. Our program is challenging but never too difficult. 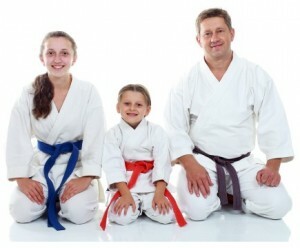 All of our classes are supervised by Certified Instructor Staff. Motivation, excitement and fun are the essential tools that we use to increase the learning and performance of our students. We offer a variety of school events that teach children how to get along well with others. There is a one-time membership fee of $30 per person. The new member will receive a uniform and unlimited access to classes offered for their rank. Our Tiny Tiger Program (4-6 yrs) is $69 per month (non contract). Students enrolled in our Traditional Program ( 7 & older) pay $99 per month (non contract). The first two family members pay full price, while all other family members within the household train for FREE! 4. How Often Do We Attend Classes? Our convenient class schedule makes joining our school easy. We offer classes in the morning, afternoon and evening. To get the most out of your training, we recommend attending at least 2 to 3 times per week. However, being a member of our school means that you will have unlimited access to the classes offered to you and your family. Call our main office (850) 478-0680 or email us masterdufour@ptsda.com to set an appointment for a school tour and try weeks of free classes. It’s a decision you will not regret. Call Today!